Fort Bragg, a 300-square-mile military cantonment and reservation in Hoke and Cumberland Counties, was authorized in August 1918 as a World War I artillery training center for 16,000 soldiers and 5,700 horses and mules but was completed after the armistice. In 1921 the camp was named in honor of North Carolina's Braxton Bragg (1817-76), a U.S. Army captain in the Mexican War and a Confederate general during the Civil War. Pope Air Field, adjacent to the cantonment, was named for Lt. Harley Pope (1879-1919), who, with Sgt. W. W. Fleming, was killed when his plane crashed in the Cape Fear River. Fort Bragg's complement of artillerymen included fewer than 3,000 officers and men. Pope Air Field had a small number of pilots whose mission was to observe artillery fire. The field was also a bustling fueling stop for army planes in transit to busier fields to the west and south. In the 1930s the base's dilapidated wooden buildings were mostly replaced by brick and stucco barracks, gun sheds, a chapel, a hospital, a headquarters, and family quarters for both commissioned and noncommissioned officers. This central portion of the cantonment has been preserved as Pope Air Force Base Historic District. In 1940, when the nation began its military buildup prior to entering World War II, Fort Bragg was expanded by a one-year barracks and hospital construction program to house as many as 60,000 soldiers, making it the largest post in the army. The Ninth Infantry Division and dozens of artillery units trained there. In 1942 Fort Bragg became the home of the 82nd and 101st Airborne Divisions; here the famous parachute and glider divisions trained for their role in the European theater. The 82nd Airborne had been organized on 25 Aug. 1917 at Camp Gordon, Ga., as the 82nd Infantry Division. Consisting of troops from all 48 states, the division acquired the nickname "All-Americans," which led to its "AA" shoulder patch. After fighting in three major campaigns over five months during World War I, the division was demobilized until 25 Mar. 1942. On 15 Aug. 1942 the 82nd Infantry was redesignated the 82nd Airborne, becoming the first airborne division in the U.S. Army. It participated in campaigns in Italy and Normandy and, for its performance in the occupation of Berlin, gained the further title (from a statement by Gen. George Patton) of "America's Guard of Honor." After the war the 82nd was permanently assigned to Fort Bragg; it was the first division to integrate black soldiers into a white unit when, in 1946, the 555th Parachute Infantry Battalion, the only black paratrooper outfit in the army, was disbanded and became part of the division. The 82nd became a regular army division on 15 Nov. 1948. Fort Bragg's population shrank to fewer than 20,000 until the Korean War, when it increased to over 40,000. In the 1950s the post was the birthplace and home of the Special Forces (Green Berets). Soldiers from the base took part in missions to Vietnam (1957-75), the Dominican Republic (1965-66), Grenada (1983), Panama (1989), the Persian Gulf (1990-91), Haiti (1995), Afghanistan (2002), and Iraq (2003). By the early 2000s Fort Bragg was one of the largest military bases in the world, housing more than 45,000 soldiers and employing 8,000 civilians on 160,789 acres. The Eighty-second Airborne Division, Eighteenth Airborne Corps, and Seventh Special Forces Group deployed from the post. Virtually the entire array of U.S. Army activities, other than the training of large armored forces, is displayed at Fort Bragg. Small post museums depict the history of airborne forces and Special Forces, now known as Special Operations. In recent years the army, in cooperation with the Nature Conservancy, has been involved in extensive protection and preservation of plant and animal habitats at the base. Ruth M. Little, Fort Bragg Main Post National Register Nomination (1995-96). Roy Parker Jr., Cumberland County: A Brief History (1990). 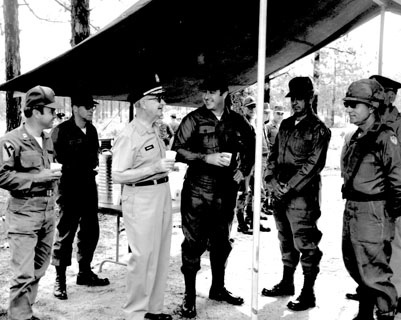 North Carolina Governor Bob Scott at Fort Bragg, c.1972. From the General Negative Collection, North Carolina State Archives, call # N_72_12_209, Raleigh, NC. North Carolina Governor Bob Scott at Fort Bragg, c.1972. From the General Negative Collection, North Carolina State Archives, call # N_72_12_209, Raleigh, NC. Available from http://www.flickr.com/photos/north-carolina-state-archives/3220041399/ (accessed August 30, 2012). 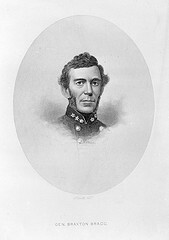 General Braxton Bragg, CSA. From the Barden Collection, North Carolina State Archives, call # N_53_15_492, Raleigh, NC. Available from http://www.flickr.com/photos/north-carolina-state-archives/4289914419/ (accessed August 30, 2012). 1 January 2006 | Parker, Roy, Jr.